Welcome to Holy Trinity Cathedral! Our Lord Jesus Christ told us, “I am come that they might have life, and that they might have it more abundantly” (John 10:10). At the center of our life, we come together in the divine liturgy. It is in this “common work” of the liturgy that we, the Church, become the Body of Christ and the Temple of the Holy Spirit. In this common work of diverse people from many backgrounds and ways of life, the Church brings to God the world: for the life of which He gave His Son. We offer our talents, time, and uniqueness as we bring together both our faith and our struggles. In worship, service projects, church school, and fellowship, we realize that in the risen Lord, real and lasting change is possible in our lives. I hope that within our parish you will be inspired to join in service to God in a warm community of neighbors that are engaged in the same task. I truly believe that in prayerful participation, you will find a welcoming place here, and make our “bringing together” even more dynamic. 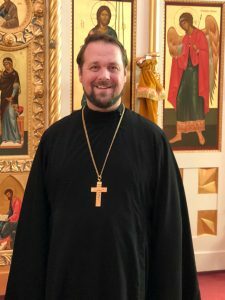 On behalf of our Archbishop Benjamin, my family, and all of us here at Holy Trinity, I pray that the rich and beautiful traditions of Orthodox Christianity will make the mystery of God’s presence and action ever more abundant in your life. I look forward to getting to know you. Please feel free to contact me at (415) 673-8565 or frkirill@holy-trinity.org. I’d enjoy having a cup of coffee with you.